It is more simple and elegant because it replaces the ambiguity with an effective clear model. I suppose that it hasn’t caught on because of the names though. And although it is elegant, I still have a gripe with this model. 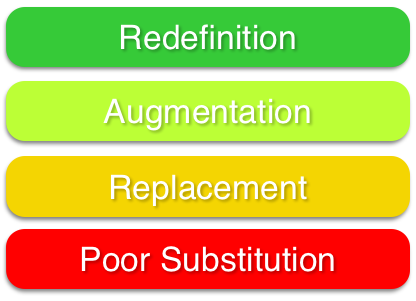 While there can be replacement, amplification, and transformation, it is missing what I see all too often and that is a level above Replacement (in RAT) or below Substitution (in SAMR) that would indicate bad substitution or poor replacement. I see educators using the latest, greatest thing that is just not that. 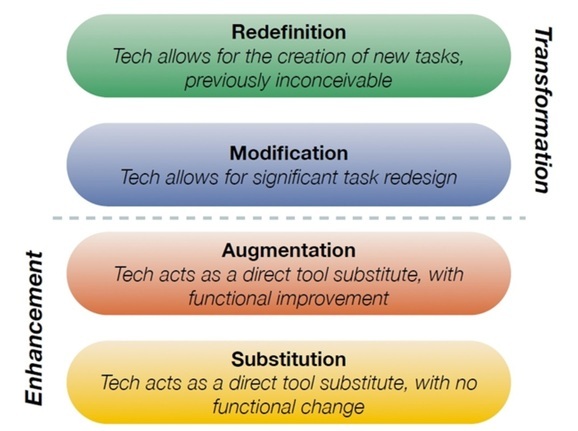 They employ fads and gimmicks – something that might wow the people for a flash in time, but that is actually detracting from the task at hand and inevitably the learning. An example of this might be using a handwriting app on the iPad. Sure it is replacement, but it is BAD REPLACEMENT. Handwriting should be done with a pencil (a real one) or pen and paper. The texture, the cost, the simplicity of using traditional methods makes this the best solution. Why are we trying to use technology in this case? One will notice the colors in the model have meaning now as well. RED means don’t do it. YELLOW is cautionary, which should indicate that an employer of technology should ask themselves if their course of action is the best way to go. LIGHT-GREEN is for go. Do it. It will enhance learning and the learner. DARK-GREEN is for go as well — only with enthusiasm. I will be coming back to this model with more ideas and revisions as time goes on. For now, write your thoughts about the P-RAR model in the comments. I feel like Byrne has written about many of the things I am doing or exploring. An excellent resource. Free, open-source, high-quality textbooks for your college course. Wow. Look at the list of Universities that are working with this organization. An interesting image of languages spoken around the world and the different dialects within.